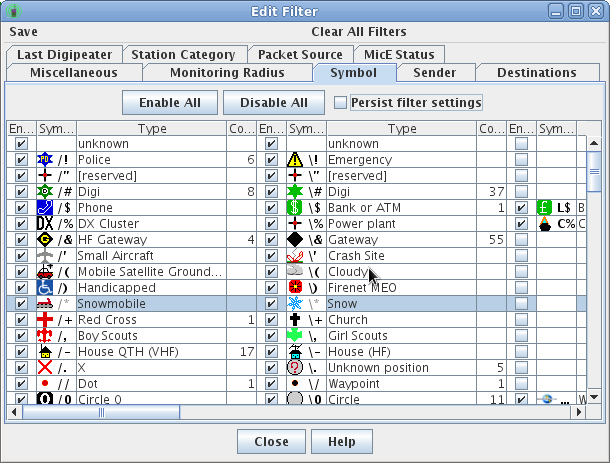 The Symbol filter allows selecting stations and objects by the type of facility they claim to be, via the symbol table ID and symbol code specified in the Position Report APRS messages sent by the stations. By default, stations using all symbols are displayed. However, any of the supported symbols may be selectively disabled. For selective enabled, all symbols may be cleared by clicking the Clear All button, then re-enabling the chosen types. Regardless of whether enabled or not, the filter will show the quantity of unique station instances for each symbol. Note that overlays added to alternate symbol table symbols will be treated identically to the non-overlaid alternate symbols, except for special reserved overlays from the APRS 1.2 extended symbol set. If the Persist filter settings checkbox is checked, the enablings of the various symbols will be remembered over restarts of YAAC.